Gunnars served as Professor of English and Creative Writing at the University of Alberta in Edmonton, Alberta, from 1990 to 2005. Visiting Scholar. Institute for British and American Studies. University of Oslo, Blindern, Norway. May-October, 1997. “Þvermenningarlegt eignarnám: Vandamál og sjónarmið,” tr. into Icelandic by Katrín Vilborgardóttir Gunnarsdottir and Guðrún Björk Guðsteinsdóttir of “Transcultural Appropriation: Problems and Perspectives.” University of Iceland, Hugvísindastofnun. Ritid: Vol. 14, No. 1, 2014. Ed. Guðrún Guðsteinsdóttir and Úlfar Bragason. 169–187﻿. "Extreme Liminality: The Linked Stories of Édouard, Juliette, and Lena in Mavis Gallant's Overhead in a Balloon". Engaging With Literature of Commitment; Vol. 2, The Worldly Scholar. Ed. Gordon Collier, Marc Delrez, Anne Fuchs, and Bénédicte Ledent. Cross Cultures Series 149, Readings in Post/Colonial Literatures and Cultures in Engish. Amsterdam/New York: Rodopi, 2012. 87-104. “Trans-East Asian Literature: Language and Displacement in Hong Ying, Hikaru Okuizumi, and Yi Mun-yol.” Reading Chinese Transnationalisms: Society, Literature, Film, Ed. Marian N. Ng and Philip Holden. Hong Kong: Hong Kong University Press, 2006. 77-88. “The Imagetext: On the All-inclusive Essay-Fiction Hybrid.” Literature Interpretation Theory, 16.4 (2005):431-439. “Translation as Appropriation.” Rediscovering Canadian Difference. Ed. Guðrún Björk Guðdsteinsdóttir. Vol. 17, NACS Text Series. Reykjavík: NACS & VFI, 2001. “Listening: Laurence’s Women.” Margaret Laurence: Critical Reflections. Ed. David Staines. Ottawa: University of Ottawa Press, 2001. 121-127. 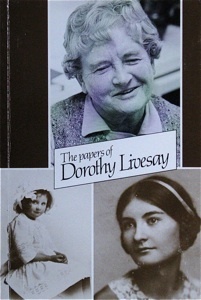 "Canonization Practices and the Canadian Bookshelf." 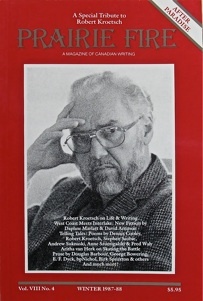 Essays on Canadian Writing 71 (2000): 232-240. "Writing and Silence." Skrivingens Rom. Trondheim, Norway: University of Trondheim, 1998. "The Idea of North and the Disclosure of Agency." Canada and the Nordic Countries. Ed. Jørn Carlsen. Volume 12. Denmark: U of Aarhus, 1997. 7-19. "Translating the Subaltern." Canadian Ethnic Studies 29.3 (1997): 75-82. "Life as Fiction: Narrative Appropriation in Isak Dinesen’s Out of Africa." Isak Dinesen and Narrativity: Reassessments for the 1990s. Ed. Gurli A. Woods. Ottawa: Carleton University Press, 1994. 25-35. “Ethnicity and Canadian Women Writers.” Room of One’s Own: A Feminist Journal of Literature and Criticism 14:4 (1991): 40-50. "The Hypothetical Text: Stephan G. Stephansson’s Autobiography." Canada and the Nordic Countries. Eds., Jørn Carlsen and Bengt Streijffert. Volume 2 of The Nordic Association for Canadian Studies Text Series. Lund: Lund University Press; Chartwell-Bratt, 1988. 109-22. "Shepherding the Self: Love in the Autobiography of Gudny Jonsdottir." Canadian Women’s Studies / Les Cahiers de la Femme 9.2 (1988): 50-53. "Avoidance and Confrontation: Excerpts from Notes on a Longpoem Poetics." Trace: Prairie Writers on Writing. Ed. Bill Sproxton. Winnipeg: Turnstone Press, 1986. 187-92. Kristjana Gunnars has written a large number of reviews for both literary and academic journals and magazines in Canada and the U.S. and Europe. Among these, she has served as a regular Nordic literature reviewer for World Literature Today, University of Oklahoma, Norman, Oklahoma. Review of Pier Giorgio di Cicco, My Life Without Me. Winnipeg: Contemporary Verse 2, Vol. 41, Issue 1, Summer 2018: 74-5. "Island Ideas." Review of Message in a Bottle: The Literature of Smal Islands, Ed. L. Brinklow, F. Ledwell, J. Ledwell. University of British Columbia, Vancouver: Canadian Literature 183 (Winter 2004): 100-101.
Review, The Flying Tiger. Women Shamans and Storytellers of the Amur, ed. Kira Van Deusen." Toronto: University of Toronto Quarterly, Volume 72, Number 1, Winter 2002-3. University of Toronto Press. Pp. 361-362. 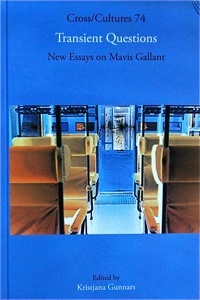 Transient Questions: New Essays on Mavis Gallant. Ed. Kristjana Gunnars. Amsterdam: Rodopi, 2004. (Readings in the Post/Colonial Literatures in English series # 74). 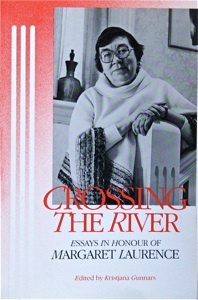 Crossing the River: Essays in Honor of Margaret Laurence. Ed. and Intro. Kristjana Gunnars. Winnipeg: Turnstone Press, 1988. “Extreme Liminality: Thomastic Thought in Three Short Stories by Mavis Gallant.” Reading Postcolonial Fiction: Tropes and Territory Conference, Sorbonne Nouvelle, Paris, France. April 22, 2005. “Poetry and the Idea of Home.” Neustadt Jury Symposium, University of Oklahoma, Norman, Oklahoma. October, 2003. “Ambiguity in Stephansson: Language and the Idea of the Other.” Stephan G. Stephansson Conference, University of Iceland, Reykjavik, Iceland. August, 2003. “On Writing Short Books.” America and Transnationalism Conference. NTNU, Trondheim University. August 9, 2003. “Transcultural Appropriation: Problems and Perspectives.” Chinese Transnationalism Conference, University of Alberta. October 12, 2001. “Theory and Fiction: The Mixed Bag of Postmodernist Writing.” Department of English, University of Gøteborg, Gøteborg, Sweden. May 9, 2001. “Translation as Appropriation.” Congress 2000, Confluence Conference. Faculté St. Jean, Edmonton, Alberta. May 22, 2000. “Writing and Silence.” Critical Dialogue Series, Department of English, University of Alberta. February 17, 2000. “The Separation of Text and Author.” Department of English, University of Windsor, Windsor, Ontario. February 1, 2000. “Positioning Stephansson.” Nordic Association for Canadian Studies Conference, University of Iceland, Reykjavik, Iceland. August, 1999. “Narrative Strategies in Thomas King’s Green Grass, Running Water.” Scandinavian Association for Canadian Studies, Norwegian Chapter. University of Bergen, Bergen, Norway. November 9, 1998. “Writing and Silence.” Seminar on writing, conception and theory. University of Trondheim. Rørås, Norway. October 7, 1997. (Published in author’s absence). “Theory and Fiction.” Seminar on the uses of theory in fiction; writing and reading. University of Trondheim. Steinkjer, Norway. April 19, 1997. “The Idea of North and Disclosure in Contemporary Canadian Literature.” Keynote address. Nordic Association for Canadian Studies Conference, Aarhus, Denmark. August 25, 1996. “Að Þýða Það Undirskipaða.” Translation of paper in English, “Translating the Subaltern,” translated by Rúnar Vignir Helgason. Stephan G. Stephansson Conference, Nordic House, Reykjavik, Iceland. May 25, 1996. “Translating the Subaltern.” Keynote address. The Icelandic Connection Conference, Red Deer College, Red Deer, Alberta. October 20-22, 1995. “Distraction/Pregnancy in Mavis Gallant’s Short Story ‘Bernadette’.” Aux Canadas Conference, University of Montreal, Quebec. April 18, 1993. “Reaction to Mary Wollstonecraft’s Scandinavian Journey.” Wollstonefest ’92, University of Alberta, Edmonton, Alberta. January, 1992. “Memory and Reconstruction in the Writing of Poetry.” University of Victoria, Department of Creative Writing, Victoria, B.C. January 10, 1992. “Autobiography as Inferno: Strindberg in Paris.” Canadian Institute of Nordic Studies, University of Alberta, Edmonton, Alberta. March 5, 1992. “Reflections of the Self in the Canadian Arctic: Vilhjálmur Stefánsson’s Autobiography.” AASSC meeting during the Learneds, Queen’s University, Kingston, Ontario. May, 1991. “Life as Fiction: Narrative Appropriation in Isak Dinesen’s Out of Africa.” Association for the Advancement of Scandinavian Study in Canada, meetings during the Learneds. University of Victoria, Victoria, B.C. May, 1990. “The Hypothetical Text. Stephan G. Stephansson’s Autobiography.” Keynote Address. Canada and the Nordic Countries Conference, University of Lund, Lund, Sweden. August, 1987. “Salverson’s Confessions of a Divided Self.” AASSC Conference during the Learneds, University of Manitoba, Winnipeg, Manitoba. May, 1986. “Ethnic Lives as Emotional History in Martha Ostenso’s Wild Geese.” Department of Germanic Studies, University of British Columbia, Vancouver, B.C. February, 1986. “The Eye on the Metronome. New Canadian Poetry in Relation to Sculpture.” St. John’s Annual Literary Conference, St. John’s College, University of Manitoba, Winnipeg, Manitoba. March, 1985.